As part of the library’s larger Memories of Migration series, we sought to include an activity that would cross family generations as well as provide an opportunity to teach digital literacy in a fun, creative way. The year-long series was supported by a grant from the federal Institute of Museum and Library Services, in conjunction with the Santa Ana Public Library (California). Workshops were hosted by the Fresh Meadows Community Library, situated in a diverse, semi-suburban part of the New York City borough of Queens. We initially planned to recruit pairs of family members -- one younger and one older -- to work together on the project. We hoped for at least five and perhaps as many as 10 pairs of participants. In practice, we had five individual participants of varying ages who each worked on his/her own quilt. We had several strategies for attracting participants. 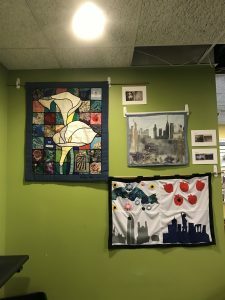 First, we reached out to library patrons who had previously participated in quilting and other craft programs at this branch, as well as individuals who were part of other migration-themed events sponsored by Queens Memory. We also promoted the workshops on both the Queens Memory website and the main Queens Library website; in both cases, those interested were directed to call or email for more information or to register for the program. Additionally, we publicized the workshop to students, staff and faculty at nearby Queens College. The interviews recorded as part of these workshops have been preserved as part of the Queens Memory collection. Clips of the interviews, along with photos of the quilts and their makers, are accessible to the public in a gallery on the Queens Memory website. Participants worked with Arduino LilyPad devices to store and play back clips of recorded interviews regarding their families’ migration stories. During the third session our STEM educator, Lynn Cole, assisted by Kevon Ajodhia, led the group through an exercise to connect the LilyPads to their related components and sew them onto pieces of practice fabric (see diagram). After the quilts were completed, participants sewed the LilyPads and components onto the backs of the quilts using conductive thread. Buttons that trigger playback of the audio clips were embedded into the quilt designs, enabling exhibit visitors to listen to the clips while viewing the display. 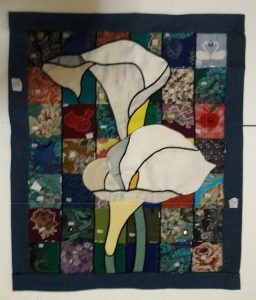 The quilts were displayed in the lobby of the Fresh Meadows Community Library from November 18, 2017, to January 23, 1018. Patrons were able to view the artwork and listen to audio clips of the interviews by scanning a QR code that took them to the Queens Memory website. Photos of the quilts along with the audio clips are now displayed in a permanent gallery on that site. 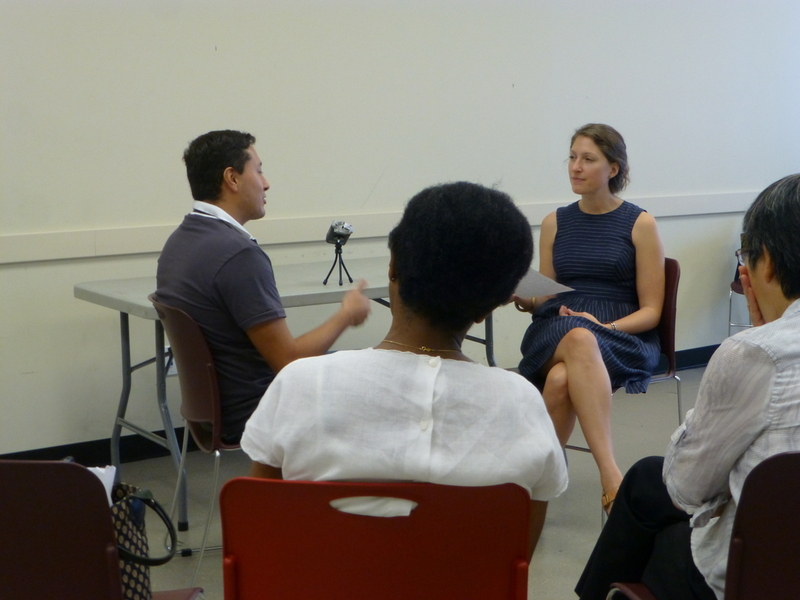 In the second session, participants paired up to interview and record each other’s family migration stories. Four out of five interviewees spoke of their own immigration to the U.S., while the fifth discussed her father’s experience. Participants learned the basics of quilting and made quilts that visually represent their migration stories. The size and complexity of the quilts vary depending on each participant’s level of experience. The group members also learned to connect and program simple electronics and sew them into their quilts. Short (approximately 1-minute) audio clips were created from the recorded interviews and copied onto MicroSD cards that were inserted into the LilyPads. The clips can be played through small speakers sewn onto the back of the quilts. A textiles artist taught participants the basics of quilt-making and led them in creating small quilts that contain the LilyPad devices. All five of our participants succeeded in completing their projects. 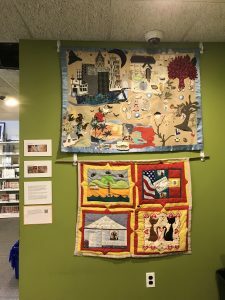 The quilts, which visually represent the migration stories recorded in the participants’ interviews, were displayed in the lobby of the host library for two months following the workshop series. The electronic components allowed clips of the interviews to play through mini-speakers when buttons sewn into the quilts were pressed. Although it proved impossible to keep the batteries continuously charged throughout the exhibit period, we compensated for this by providing a QR code on the exhibit signage that allowed visitors to hear the clips on the Queens Memory website. 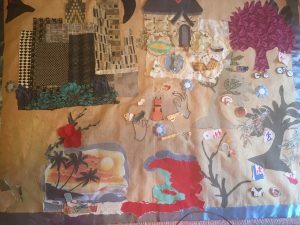 We were quite pleased that all the participants who committed to the series successfully created story quilts. A very nice bonus was that the group members became fast friends, helping and supporting each other even outside of our meeting times; the group has continued to communicate about related topics, and several members have expressed interest in future quilting programs. The most important lesson we’ve taken from this experience is the need to plan – way in advance – for all contingencies. There was a steep learning curve for our staff members regarding the LilyPads, and receiving the equipment so close to the start of the series put us at a disadvantage. We also realize that our initial goal of working with 10 pairs of participants was overly ambitious for the first iteration of such a workshop. It was fortunate that we had a smaller group, as we were able to work together much more closely and help each other through the learning process. Natalie Milbrodt, Lori Wallach and Richard Lee were the Queens Memory team that coordinated and helped facilitate the workshops. Lynn Cole is Interactive Exhibits Supervisor at Queens Library and led the technology instruction portion, with assistance from Kevon Ajodhia of the library’s Children’s Library Discovery Center. 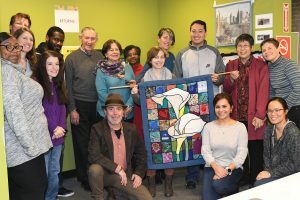 Madlyn Schneider of Queens Library’s Older Adult Services secured additional funding from the Fan Fox Leslie R. Samuels Foundation for the quilting instructor, and also assisted with promotion of the series. Karen Fitzgerald was our teaching artist who led all quilting instruction. 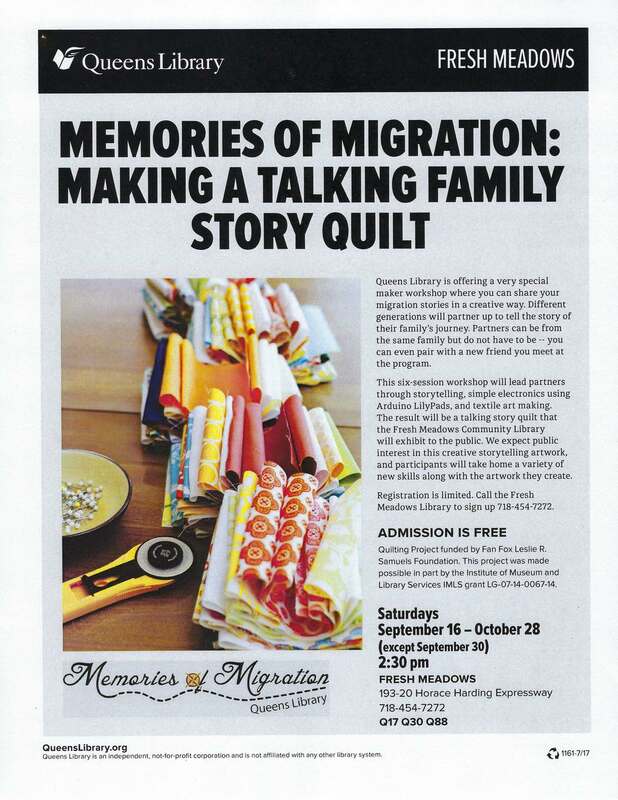 This event was part of the Memories of Migration initiative, funded by an IMLS National Leadership Grant for Libraries. Queens Library was one of four Model Programs across the country, responsible for working with local communities to develop inter-generational and cross-cultural dialogue through public programs. Additional funding was provided by the Fan Fox Leslie R. Samuels Foundation. Our initial discussions took place via several telephone meetings; participants included project director Natalie Milbrodt; project archivist Lori Wallach; Queens Library Older Adult Services coordinator Madlyn Schneider; STEM educator Lynn Cole; and teaching artist Karen Fitzgerald. Karen’s spring quilting class in the Fresh Meadows meeting room where our workshops will take place. Lori and Madlyn went to the Fresh Meadows branch to attend the final session of Karen’s spring quilting workshop. While there, we introduced ourselves to the participants and explained the upcoming project; one quilter expressed interest in it and gave us her contact information. Following the group session, we explored the space and talked about next steps with Karen and branch manager Susan Xie. We held an in-person planning meeting at Fresh Meadows, including Natalie, Lori, Richard, Madlyn, Karen and Lynn — all the staff members who will be participating in the project. We firmed up details for the first (orientation) session and clarified with Karen what types of fabrics participants should seek to gather. Lori brought the beginnings of our sample square, which Lynn approved and made further suggestions. We all agreed to step up our promotion of the series to ensure we have at least 10 pairs of participants signed up by September. Natalie and Madlyn will try to get flyers/postcards printed by the Queens Library production department, and Lori will reach out to several community organizations. Karen will also mention the series to the students in her current intergenerational watercolor class (also at Fresh Meadows). We’re eagerly awaiting the arrival of the LilyPads so Lynn and her teen Discovery team can start learning how to work with them. At the conclusion of the meeting, we scouted out a good location near the entry of the library for the quilt exhibit following the series. During the summer months, all members of the team worked on different aspects of the workshop plans, checking in with each other frequently via email, phone calls and in-person meetings. Natalie, Lori and Karen drew up facilitator outlines for the six sessions; Lori created a basic sample quilt for demonstration; and Lynn and Kevon researched how best to work with the LilyPads (SparkFun’s online tutorials proved very helpful). At the same time, we all worked to promote the series to potential participants, advertising via printed flyers, social media, email listservs and word of mouth. One problem that came up was a significant delay in our receipt of the electronic components. Because we had to order our equipment through the City of Santa Ana as per grant rules, numerous bureaucratic snags resulted in our not having the LilyPad sets even four months after ordering them. With the first workshop only several weeks away, Natalie had to request an emergency reallocation of some grant money to allow us to purchase a smaller set of components directly through Queens Library. These arrived just a few days before our first workshop. Although Lynn and Kevon did a great job of mastering the equipment quickly, we did not have the time we would have liked to feel comfortable with the devices, and had to admit to our participants that we were learning right along with them. This was the opening session of the workshop series. Natalie began with a brief account of her own migration story from Detroit to New York City in 2005 as a way to set expectations for the personal sharing participants should anticipate during the workshop. She also provided an overview of the activities we planned to undertake – recording short interviews about each participant’s family migration story; creating a quilt square that visually represents that story; and programming audio clips from the interviews into LilyPads, electronic devices that will be sewn into the quilts and enable playback of the clips. She then had participants introduce themselves and explain what they hoped to learn in the workshop. Afterwards, Lori showed a simple quilt square she had created as an example, and Lynn and Kevon demonstrated the LilyPad and its components. In the second half of the session, Natalie explained the interview format and had participants pair off to choose questions from a list of prompts for their interviews the following week. Before the afternoon ended, Lori briefly described the fabric types and sizes they should start gathering for the later quilting sessions. The session ran for two hours, from 2:30 to 4:30 pm. See our facilitator outline and read our full event report. This session was dedicated almost entirely to recording participants’ interviews. To make sure we had plenty of time for recording everyone, Natalie, Lori and Richard set up an “interview set” in advance, with two chairs facing each other and a digital recorder positioned between them. Additional chairs were arranged in a U-shape to allow all attendees to hear each other’s stories. Pairs of workshop participants interviewed each other while the rest of the group listened to their migration stories; each interview was approximately 20 minutes. Once several attendees arrived, we began recording. Using the questions they had selected the previous week, participants recorded 15- to 20-minute interviews about their family migration experiences. Four out of five interviewees spoke of their own immigration to the U.S., while the fifth discussed her father’s experience. We took a short break in the middle of the session to have Lynn and Kevon demonstrate how the LilyPad and its components will attach to the quilts, using the sample square from the previous week. We then continued the interviews until all were recorded. The session ran two and a half hours, from 2:30 to 5:00 pm, the library’s closing time. See our facilitator outline and read our full event report. This session was focused on teaching participants about the LilyPad and its related components. Lynn began by having the attendees gather around one table, where she and Kevon showed them a complete set of components sewn into the sample quilt square, with alligator clips connecting the speakers as a temporary method. Using a diagram handout, they explained how conductive thread would ultimately be used to connect the speakers. We then gave each participant his/her own set of components and had them practice connecting the parts with Lynn and Kevon’s help. Most of them also had time to loosely sew the electronics onto a piece of fabric (with standard thread) to get a feel for how they will attach to the quilts. Once the devices were all assembled, we gave everyone the mini SD cards containing the clips we created from their interviews, and they were able to listen to the clips through the LilyPads using earbuds or the speakers. While the participants were working on their components, Lynn pulled a number of books on quilt design off the library’s shelves and brought them in the room for people to browse. Several participants checked out the books to take home with them. At the end of the session, we collected the assembled LilyPad sets for safekeeping and took back the SD cards in case edits needed to be made. All the participants received their full interview recordings plus the clips on flash drives to keep. We reminded them that Karen, the quilting instructor, would lead the next session and that they needed to bring their fabric and quilt design ideas. The session ran two hours, from 2:30 to 4:30 pm. See our facilitator outline and read our full event report. This session marked the shift of the project to the design and construction of the quilts themselves. 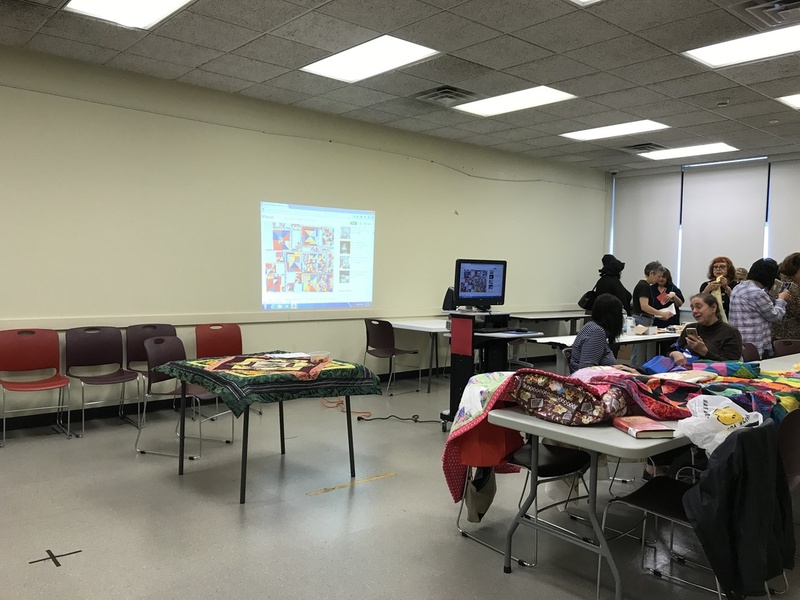 Karen Fitzgerald, our teaching artist, led the session, drawing from her extensive experience conducting quilting classes, many of them at Queens Library branches. Before the participants arrived, Karen set up the room with sewing machines and ironing stations, and hung up photos of various types of quilt designs. She also brought and laid out an impressive array of sewing supplies, fabric remnants, buttons, sequins, etc. to share with the quilters. On the room’s whiteboard, she outlined the goals of the session: to explain the applique technique for quilt design and how the electronic buttons might be worked into the design; how to create pockets on the quilt’s back for the components and a rod pocket for hanging the quilt; and how to finish the edges. As the participants gathered around a table, Karen discussed these topics and demonstrated various techniques while the quilters watched, and some took notes. 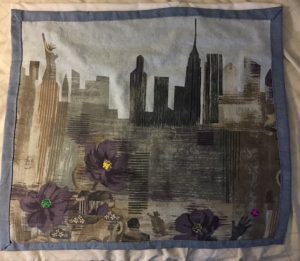 She also showed them how to use Wonder Under, a specially treated paper that allows fabric appliques to be ironed on to the quilts instead of requiring extensive hand sewing. After explaining these points, Karen worked with each participant individually. 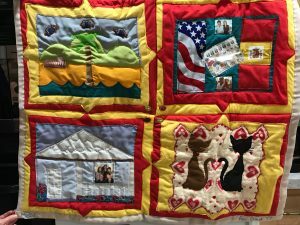 Depending on their prior experience and the time they had spent working on the projects at home, the quilters were at very different places in their processes, but Karen easily addressed their concerns. 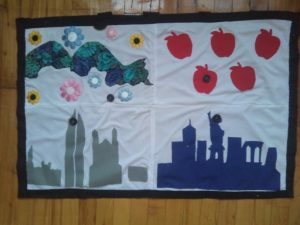 Several participants, for example, asked her to teach them how to use the sewing machine, while another had brought a nearly done portion of her quilt and had questions about batting material. The second hour of the afternoon was dedicated to such individual instruction and independent work; in many cases, the more experienced quilters helped the beginners select fabrics and accessories following the design principles Karen had explained. This session was led by Karen with assistance from Natalie. The goals were to continue utilizing the techniques taught in the previous session to construct the quilts, and to begin attaching the LilyPad components. As was the case last week, our participants were at very different points in their progress, so Karen spent much of her time assisting each one individually. One member was almost done with her quilt, for example, and needed help to attach the pieces to a backing; others were still at the point of cutting out shapes to be applied. Karen also discussed how the electronic buttons could be incorporated and highlighted in the designs. During the session, Lori and Natalie tested the volume level of the clips on a mini SD card that Lori had amplified; the new level seemed sufficient for playback. They also gathered information from the participants on the projected dimensions of the quilts and measured how they might be hung in the library’s lobby area. Karen advised on the types of dowels and hooks that could be employed. At the end of the session, we reminded participants that next week would be the last session, and that they should be ready to do the final sewing of the electronics into their completed quilts. No formal instruction took place during this session. Participants worked toward the completion of their quilts, getting help from instructors with things they could not solve by themselves at home. One participant was completely finished at the end of the session (with some help from her mom, who attended and worked alongside her). The other four participants left with widely varying amounts of work to complete at home. One participant was confident on the electronics aspect of his quilt and came with that part finished, but needing to use the sewing machines available at the library and seeking some advice from Karen about the sewing. Another participant got good photos of a working LilyPad, with conductive thread sewn correctly on the back, that she would then take home and use for reference. Everyone did hours of work at home between sessions and most had many more hours of work to do after the session. Finishing touches that day involved sewing pockets for the Arduino batteries, stitching buttons, using conductive thread to create a grounding wire and relays for the buttons, etc. We took final measurements and made sure the dowels and Command hooks we planned to use to hang the quilts would work. 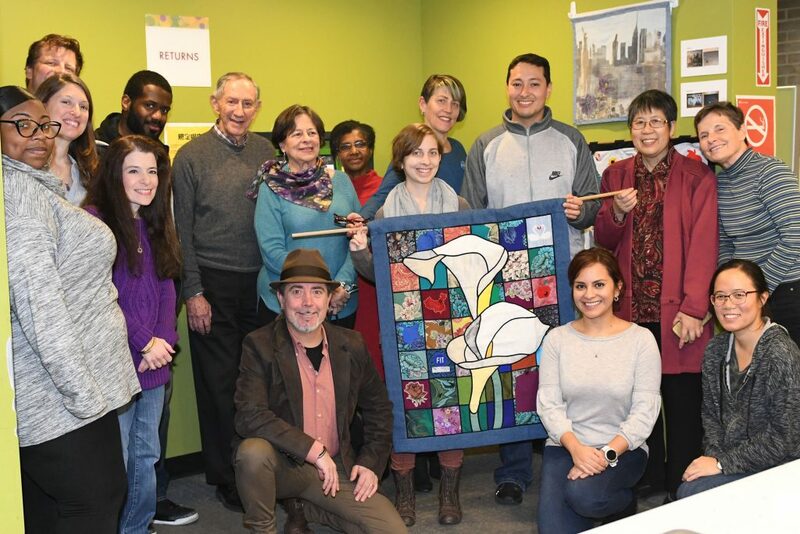 After giving our participants some time to finish working on their quilts at home, we brought everyone back to Fresh Meadows to install the exhibit in the lobby of the library. We met in the same room where our workshops had taken place, and a few quilters needed last-minute help from our tech team to connect some of the electronics. When all the pieces were ready, we hung them on dowels using damage-free Command hooks on either side of the library’s book return kiosks in the lobby. Patrons and staff were curious about the exhibit as it went up. The two larger quilts were hung on one side, with signs explaining the exhibit and giving viewers a QR code linked to the audio clips on our website. The three smaller quilts were hung on the opposite side of the book return area. Quilters’ family members joined us for the exhibit opening and reception, featuring a potluck of ethnic foods. Since our quilting group had grown so close over the weeks of the workshops, we decided to have a little potluck reception following the hanging. We invited everyone to bring their family and an ethnic food to share. This turned out to be a wonderful way to cap off our adventure. We met a number of the family members who were mentioned in the interviews, and everyone enjoyed sampling the various cuisines represented. After two months’ time, we took the exhibit down from the library’s lobby and returned the quilts to their makers. We were happy to see that nothing was damaged, and our participants were eager to retrieve their work to show to family and friends.